Browsing of white-cedar foliage by deer negatively impacts tree growth and survival. White-tailed deer (Odocoileus virginianus) are common in forests and farmlands throughout the United States and Canada. While their propensity for eating gardens and ornamental plants is well-known to frustrated homeowners, few outside the wildlife and forestry professions are aware of the profound effects deer have on forest understory composition and growth. Even when populations are not exceedingly high, deer have a controlling effect on forest vegetation in many regions, including the northeastern and north central U.S. and southern Canada where their range overlaps with that of the northern white-cedar (Thuja occidentalis L.). Not only are these evergreen conifers a crucial browse species for deer, but herds also frequently use mature stands of the trees — alone or in mixture with other conifers — as overwintering habitat. However, heavy browsing has led to regeneration and recruitment failures in white-cedar populations across regions of the countries’ shared border. Studying the effects of deer browsing on white-cedar regeneration dynamics presented an ideal opportunity for scientists to collaborate on efforts to improve the conifer’s sustainability. What makes this effort across the two countries unique is that it involves multiple collaborations aimed at employing scientific practices to facilitate the coexistence of sustainable forests and wildlife. Participants include foresters and wildlifers — in both management and scientific positions — who call themselves “The Cedar Club” and represent the U.S. Forest Service, Northern Research Station; Canadian Forest Service; Quebec Ministry of Forests, Wildlife and Parks; Laval University; University of Maine; and other private, governmental and academic institutions. White-cedar is an ecologically, culturally and economically important species. Ecologically, the tree — which is often found in pure stands on lowland sites and in mixtures with hardwood and other softwood species on seepage and upland sites — is a critical component of forest biodiversity. Regeneration of the tree is most successful on moisture-holding substrates such as mineral soil or decayed organic matter (Cornett et al. 2000) and in partially shaded environments where drought stress is low and competition from faster-growing species is limited (Larouche et al. 2011). White-cedar trees are also a source of nesting material for American red (Tamiasciurus hudsonicus) and northern flying squirrels (Glaucomys sabrinus), a behavioral adaptation to the anti-parasitic properties of the bark (Patterson et al. 2007). In addition, pileated (Hylatomus pileatus) and three-toed woodpeckers (Picoides dorsalis) like to use the trees for nesting and cavity excavation, and numerous other bird species — including 15 of 22 species of wood warblers in Michigan — are associated with white-cedar habitat (Doepker and Ozoga 1991). White-cedar stands are also found in wetland habitats that support rare plant species such as the showy (Cypripedium reginae) and ram’s head lady’s slippers (C. arietinum) (Sorenson and Popp 2006). Some Native American peoples regard white-cedar as a sacred plant, with a prominent role in spiritual rites and traditional daily uses. The trees historically provided rope, sturgeon spears, arrow shafts, healing poultices, canoes and tinder for starting fires (Plante 2013). Today, First Nations people such as the Huron-Wendat of Wendake in Quebec continue to use white-cedar in purification ceremonies, for traditional medicine and as a source of vitamins (Dumont 2012). White-cedar is used to manufacture a number of commercial products — shingles, mulch, posts, patio furniture and log homes — that represent $15 – 20 million annually in mill-delivered log revenues in New England, Ontario and Quebec (Boulfroy et al. 2012). The white-cedar industry also helps support rural communities and has long been part of the regional economy. Although white-cedar shingles were one of the earliest sources of income for some northern forest communities (Judd 1989), recent studies in Maine and Quebec suggest that the trees take about 100 years on average to reach usable, pole-size timber and closer to 200 years to reach shingle-stock size (Hofmeyer et al. 2010). The relationship between white-cedar and deer is critical to the cervids in areas where their ranges overlap. White-cedar stands with high, mostly closed canopies provide protection from deep snow in the winter, making them a frequent wintering area (Morrison et al. 2003). The trees’ palatability and nutritive value also make them a preferred and important source of winter browse for deer (Fowells 1965). White-cedar researcher Catherine Larouche hugs a mature tree. Her work in Quebec and Maine suggests that strategies such as retaining unlopped tops after harvest to form barriers or growing white-cedar in close association with less-palatable species might limit the access of deer to young white-cedar trees and reduce herbivory. Given this close association, the effects of the cervids’ herbivory on the trees have been a concern since the early 1900s. In fact, The Maine Sportsman reported substantial deer damage to the trees around backwoods ponds as early as 1907 (Stanton 1963). At that time, extirpation of wolf populations, restrictions to market hunting and increases in suitable habitat in aggrading second-growth forests resulted in expansion of deer populations, and evidence of habitat degradation became more apparent (McCabe and McCabe 1997). By the 1950s, forest regrowth and mixed farm and forest environments increased available habitat, and deer populations rose to unprecedented levels. Since that time, their numbers have declined in some regions due to harsh winters, predation and hunting, which has led to restrictions on hunting seasons and bag limits as well as regulation of deer wintering areas. Still researchers and practitioners today continue to document excessive browsing by deer in many areas, and white-cedar recruitment failures remain commonplace. In spite of an abundance of seedlings on the forest floor, few — if any — develop into saplings in areas with high densities of deer (Botti 1991, Forester et al. 2008). Catherine Larouche, a research scientist at the Quebec Ministry of Forests, Wildlife, and Parks, is founding member of The Cedar Club and has been working with colleagues in Quebec and Maine to document the effects of deer herbivory on seedlings and saplings since 2004. One of her study sites located in central Maine’s Penobscot Experimental Forest is a long-term USFS silvicultural study that focuses on controlling the establishment, growth, composition, health and quality of forests to meet diverse needs and values of landowners and society on a sustainable basis. 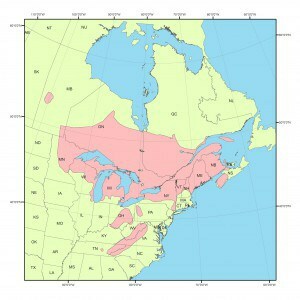 Deer density in this region is close to 20 per square mile. In contrast, another study area in Quebec at the northern range limit of deer had successful whitecedar regeneration and recruitment (Larouche and Ruel 2015). Together, these findings underscore the role of herbivory as a limiting factor in white-cedar communities. Larouche’s work and that of Phil Hofmeyer, assistant professor at Morrisville State College, suggests that it can take more than 30 years for white-cedar to grow beyond a browsing height of 6 feet if the surrounding herbaceous and shrub species are not controlled (Larouche and Ruel 2015, Hofmeyer et al. 2010). This means that seedlings and saplings are exposed to browsing for many decades. Yet Hofmeyer and his colleagues found that white-cedar growth rates are highly variable. Using stems harvested from central and northern Maine, they observed that while the trees take about 100 years to reach pole size, the range is from less than 30 to more than 170 years (Hofmeyer et al. 2010). These findings, which are supported by Larouche’s, suggest that white-cedar have the potential to grow faster in favorable light environments. In the Quebec study, researchers also found that while establishment of white-cedar seedlings is best in a partially shaded environment where competition is limited and drought stress is reduced, growth rates increase with increasing light (Larouche et al. 2011, Larouche and Ruel 2015). Similarly, a study of white-cedar trees in partially cut stands found increased growth with releasing events such as timber harvesting and natural disturbances (Ruel et al. 2014). Based on this work, The Cedar Club created a white-cedar silvicultural guide that was jointly published by the USFS and CFS (Boulfroy et al. 2012). It contains useful information for practitioners such as new and innovative approaches to white-cedar management — including a multiple-treatment approach in which small areas of white-cedar called micro-stands are identified and treated within mixed-species stands — and holds the record as the most downloaded, French-language publication on the CFS website. However, the guide falls short of offering a solution to white-cedar sustainability in areas with high deer density. Possible alternatives include concentrating silvicultural activities in areas where deer densities are low, using logging slash such as unlopped tops to create exclosures and limit deer access, thinning to accelerate growth of small white-cedar to larger-size classes or selectively retaining neighboring species that provide associational resistance (Boulfroy et al. 2012, Herfindal et al. 2015). These methods are largely untested or have shown variable results (Palik et al. 2015). Given the lack of scientific support for these alternatives, The Cedar Club has initiated new silvicultural trials in Quebec in order to provide additional guidance in the future. Currently, white-cedar harvest is restricted or prohibited on some public lands due to these concerns about sustainability, while in other areas harvest continues and even exceeds growth (Hofmeyer et al. 2010). New trees must be recruited to replace the old ones; however, it remains unclear how to do that in areas with high deer populations. In addition, there is little public support for efforts to reduce deer populations throughout much of the white-cedar range. For many hunters, seeing deer is a measure of the quality of the hunt and the integrity of the forest. Public agencies are under pressure to maintain or increase the size of deer herds in many areas and therefore have restricted cutting trees in wintering habitat. Such practices lead to concerns about the successful regeneration of white-cedar and the continued contribution of this species to the composition, structure and function of eastern North American forest ecosystems. The effects of climate change on the range and density of deer at northern latitudes are also not known, but may extend the areas where interactions between deer and white-cedar are a concern. To date, the collaborative efforts of U.S. and Canadian wildlife and forestry personnel have produced some useful scientific findings that may help natural resource managers overcome the challenges of sustaining forest and wildlife resources in an uncertain future. Only with continued collaborations between foresters and wildlifers as well as ongoing dialogue with the public can we hope to approach effective solutions to this natural resource management dilemma. Laura S. Kenefic, PhD, is a research forester at the U.S. Forest Service, Northern Research Station. Jean-Claude Ruel, PhD, is a professor of silviculture at Laval University. Jean-Pierre Tremblay, PhD, is an associate professor of applied ecology at Laval University.